CNN Sunday, January 8, 2012 -- A Vietnamese man is recovering in the intensive care unit Friday, a day after surgery that completely removed from his right leg a tumor twice his body weight, according to the hospital in Ho Chi Minh City. The tumor was first discovered when Hai was four years old and had grown to its enormous size since then. 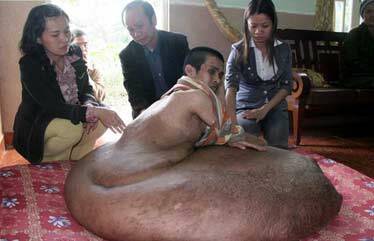 The growing tumor had rendered the patient, Nguyen Duy Hai, virtually immobile until his surgery. 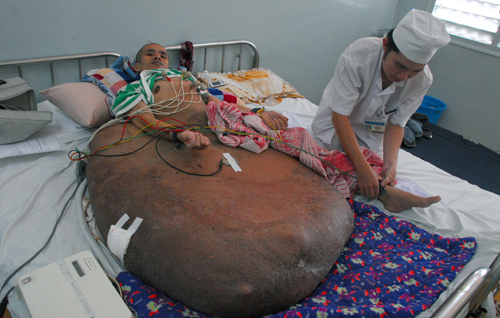 The excised tumor weighed 180 pounds (82 kilos), according to the hospital, a bit less than the 200 pounds (90 kilos) estimated before surgery. Hai, 31, of Da Lat City, has Von Recklinghausen's neurofibromatosis, said Dr. Jean-Marcel Guillon, chief executive officer of FV Hospital, where the 12-hour procedure was performed. The tumor, which originated in Hai's spine, "may return," Guillon wrote in e-mails to CNN, "but we can operate him again, and it won't ever reach such a size anymore." Doctors expect that Hai's cardiac and pulmonary functions will return to normal during the next 10 days. After that, Hai faces rehabilitation, physical therapy and possible help from the hospital's clinical psychologist to deal with issues pertaining to body image, Guillon said. 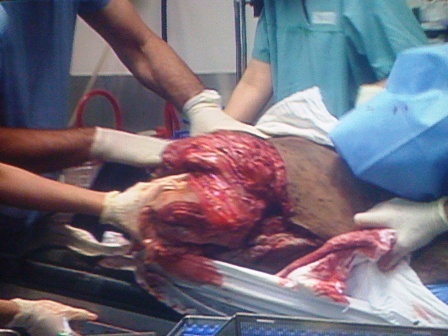 "This patient lived all his life with this tumor. It was part of him." Hai also needs to learn how to do things that his body had forgotten, including using the left leg he had never used normally, Guillon added. The latest surgery was considered risky with a 50% success rate for a number of reasons, Guillon explained. "First, such a giant tumor has developed its own blood system with huge arteries branched out from the normal vascular system. Therefore, one of the main risks was abundant bleeding." Doctors used a "cell saver," which suctions and filters the patient's blood before re-injecting it into the body, along with extra blood for the surgery. The second and third risks lay in heart function ("How would a heart react when a tumor with twice the weight of a patient is removed?") and the effects of a long -- more than 13 hours -- anesthesia, Guillon said. Leading the surgical team was Dr. McKay McKinnon, a specialist in plastic and reconstructive surgery from Chicago. McKinnon has been credited with removing a 200-pound tumor from a woman in the U.S. state of Michigan in 2000, as well as a 176-pound (80 kilo) tumor from a Romanian woman in 2004. Aside from McKinnon, no one else on the team had any prior experience with Hai's condition or performed such a surgery before, Guillon said. "Though the surgical techniques used by Dr. McKinnon are usual and routinely used by our surgeons, the difference lays in his experience: he knows what to expect and what to do at specific crucial moments." During the surgery, FV Hospital set up a live video feed for other doctors and hospitals to watch. Video during the surgery showed five people assisting in the disposal of the excised tumor from its own gurney into a yellow container, which was then sealed. A small piece has been sent for examination; the rest will be incinerated as with all biological waste, Guillon said. A tumor is commonly used as a synonym for a neoplasm (a solid or fluid-filled, cystic lesion that may or may not be formed by an abnormal growth of neoplastic cells) that appears enlarged in size. Tumor is not synonymous with cancer. While cancer is by definition malignant, a tumor can be benign, pre-malignant, or malignant, or can represent a lesion without any cancerous potential whatsoever. 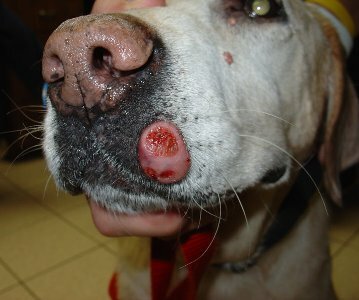 A neoplasm can form out of an abnormal proliferation of tissues, which can be caused by genetic mutations. 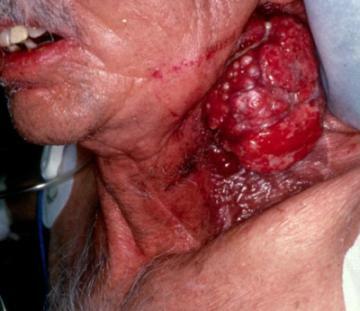 Not all types of neoplasms cause a tumorous overgrowth of tissue, however (such as leukemia or carcinoma in situ). The nature of a tumor is determined by imaging, by surgical exploration, and/or by a pathologist after examination of the tissue from a biopsy or a surgical specimen. In general, tumors occur when cells divide excessively in the body. Typically, cell division is strictly controlled. New cells are created to replace older ones or to perform new functions. Cells that are damaged or no longer needed are supposed to die to make room for healthy replacements. If the balance of cell division and death is disturbed, a tumor may form.